As you know LINN make two versions of the Radikal. The Akurate and the Klimax (at some £2k more) and it has been demonstrated that the Klimax sounds better. How can this be when the electronics are the same in each (confirmed by David W @ LINN) So what differences are there? Well, in the Akurate the boards are conventionally mounted on the bottom of the case. In the Klimax the boards are inverted and mounted on the 'top' of the case. The Akurate has the 'conventional' pressed and folded Aluminium sheet. The Klimax case is CNC's from a billet of Aluminium, and weighs in some 6kg heavier. Also the 'web' between the Power supply and the control board is much thicker. So, what can we do to get a Klimax Radikal on the cheap? Inverting the boards is not going to be easy, and inverting the whole case would look awful. But adding mass. Thats easy to do. I tried a heavy book on top of the case as a test. Due to the way the Radikal is placed on my rack I was limited in what I could use. The best I could try weighed in at just over 500gm. Did it make a difference? Well I thought so. In fact I thought so enough to take me onto the next step. Total mass added will be about 4kg. Not bad. Removing the top from the case will invalidate any warranty that is remaining on your Radikal. Also be mindful that the you need to observe electrical safety precautions at all times. There are lots of nasty volts running around inside the case and you proceed at your own risk. Neither I or the HiFi Kabin can be held responsible for any injury or damage sustained. Before starting, file and sand edges of the Aluminium sheet to remove all burrs, sharp edges and cutting marks. Then make sure that it is TOTALLY clean, The last thing you need is bits of stray Aluminium inside the Radikal case. I used my Record Cleaning fluid and some Paper towel. Remove the case using T 10 driver to undo the four bolts and slide the top backwards. You will need to make a cut-out to allow the cable to pass between the Power Supply and control board. The best approach is to make a cardboard template and transfer that to the Aluminium sheet before drilling and cutting as needed. File and sand any cuts smooth. Drill 3mm and 8.5mm holes as indicated on photo 2 for the grounding cable and cable ties. See Photo 3 to see how the ties hold the plate in place. I added some draught excluder at the places arrowed as there was a slight rattle against the captive Nuts. Refit the case by sliding it in place and replacing the T 10 bolts. Place the Radikal back in its rack, connect the cables and place the Top Plate in place. Well, firstly how it sounds bit by bit. Internal Divider:- Slight (and I mean slight) increase in the quality of music. Top Plate:- More musical and solid. Internal divider and Top Plate:- Not a great difference to the top plate alone. Full set:- More of the above. Musically better and firmer bass. More enjoyable to my ears. Knowing what I now know, I would forget about the Internal Divider. Its a lot of work for a very minimal outcome. Adding the top and bottom are no brainers. Is it as good at a Klimax? I doubt it, but that is not the point. It is better than an Akurate and that was the object of the exercise. Would more mass give a better outcome? Probably. It would be interesting to add a 20mm slab (~ 7kg) to the top instead of the 'set of three'. Could be a bit unsightly though unless the edges are curved to minimise its '2001ness'. That means it would need painting as trying to cover tight curves with Vinyl Wrap is a right bugger to get right. The total (Aluminium, felt, bolts, vinyl) came to about £60 + the other bits that I already had in my 'odds and sods' box. I have drilled a 2mm hole in the rear edge of the top plate and made a 2mm plug to fork connector cable running between the top plate and the Radikal's earth post. 10 min work, £0-00 outlay and more music. Yes really. The musicians have taken lessons over night, tuned the instruments and the conductor is really on the ball. So you do not need just mass, you need shielding as well. If you do nothing else, I recommend this mod to the Radikal. Its cheap (maybe £35 all in for the top plate and grounding wire) and does not involve removing the case. ... and I am still wondering about a 20mm thick slab. ... or several thinner slabs, all with felt constraining damping and grounded to the casework. Is that real vinyl wrap or sticky backed plastic? 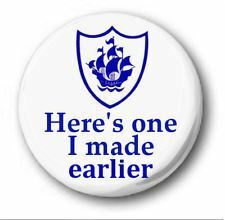 Shouldn't it be called, The Blue Peter Light Badge? Interesting experiment Mr. O. Although the Klimax case is heavier it also is 'dead' when you tap it with your knuckle compared to the Akurate which is not quite like a drum but certainly sounds hollow. When we discussed the why's and wherefores at the social it was thought that the internal segregation of the power supply was a lot to do with it. Roger even commented about removing the supplies to separate boxes like Naim do. Interesting that the case seems to have more of an effect in your trials. For giggles it might be worth turning it upside down on some rubber feet or wooden cones to see if suspending the electronics makes a difference as the klimax cases do. As the lid of the box slides on you could not damp it with something like Dynamat easily but the base could be done inside (and out) and possibly the inside of the one side and back panel. It's very effective on cars at damping noise and vibration transfer and stopping panels from 'ringing'. Did you try it with the lid off? Vinyl wrap as sold to the car modding fraternity. shellspeed wrote: Interesting experiment Mr. O. Although the Klimax case is heavier it also is 'dead' when you tap it with your knuckle compared to the Akurate which is not quite like a drum but certainly sounds hollow. The Akurate case it certainly a lot 'deader' now. shellspeed wrote: When we discussed the why's and wherefores at the social it was thought that the internal segregation of the power supply was a lot to do with it. Roger even commented about removing the supplies to separate boxes like Naim do. Interesting that the case seems to have more of an effect in your trials. I was surprised that adding the shield between PS and control board made such a small difference. if I can find the correct plug and socket I'll try moving the PS 'off case'. It appears to be a single unit that should come out after undoing a few bolts. shellspeed wrote: As the lid of the box slides on you could not damp it with something like Dynamat easily but the base could be done inside (and out) and possibly the inside of the one side and back panel. It's very effective on cars at damping noise and vibration transfer and stopping panels from 'ringing'.? I did wonder about damping the case, but I wanted to it be as reversible as possible. Theres certainly loads more room to experiment here. I think in all fairness the most advantageous application for the weight is on top. Most RF receptive items of electronics are usually above Radikal phono stage,preamp etc in most cases. But it seems the favoured option is to have the Radikal on the very top with no electrical noise in any vicinity " ideal wall shelf turntable scenario " but most of us are fixed to the floor and likewise the Radikal resides on the bottom thus emphasising the superiority of the Klimax case with its screening from the vicinity syndrome. Suggested inversion of the Akurate case doesn't address board orientation differences ideally as in the Akurate the Dynamic PS is mounted on its side. " obviously no space inside for proper mounting "
The weight on top would address two criteria screening barrier and case resonance limitation. Father Jack has a less technical approach he looks happy too. Tesco granite chopping board on top? Jazz Club wrote: Tesco granite chopping board on top? I have 2 from Argos, will they be as good? Thank you mr onion ! Listening to john martyn solid air =a lovely free upgrade !! Derosa wrote: Thank you mr onion ! PHEW! Glad I am not going mad. I have just added a wooden chopping block to the top of mine, and its even better than it was. I suspect its both the mass and screening effect that the aluminium gives. Theres certainly more here that we ever suspected.